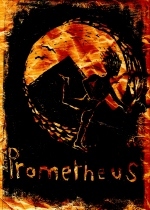 Physical theatre practitioner Philip Knight and experimental musician Mike Gosling collaborate on this exploration of the Prometheus myth and its relationship to thought, creativity and personal ritual. Devised from a series of poems written as a meditation on the story of fire being stolen from the gods, the performance explores the idea of freedom in a universe filled with mystery and power. Nothing is fixed — each performance is a living event. 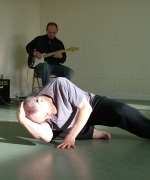 The performer and musician simultaneously reacting to each other and the text in a continual improvisation. A search to find a balance that most efficiently expresses what the words might mean. Philip Knight is a physical theatre performer and director with over twenty years of experience creating performances for the stage. He began his career on the alternative cabaret circuit as a member of Open Secret before becoming artistic director of Third Theatre Ltd., a physical theatre company touring issue based devised work throughout the British Isles. His unique methods of creating theatre are featured in Chris Johnston's book House of Games. He has lectured in theatre and movement in Brighton, London and Salford Universities. He believes in the active democratisation of the creative process and its integration into a healthy society. Mike Gosling is an experimental musician who has contributed songs and instrumental music to theatre pieces as well as writing and playing guitar in various folk and rock bands. He has written music for the Third Theatre productions of Man Of Straw, Dispossessed, Guernica and Material Accounted For. This music drew on a wide range of world music influences with much of the music being created by improvisation. He has also created ambient music with his group Conference of Birds. This music was based on drone-based improvisations and spoken word samples. This was released on the Evensong label, which Mike set up in 1999. Evensong also ran a recording studio and promoted various left-field acts including Mila Drumke, who performed her first tour of the UK with the Evensong label. 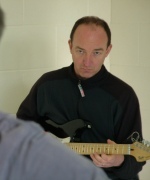 As well as performing in the Prometheus project, Mike is currently writing and recording songs for his band, The Brink.